My New Red Buffalo Check Living Room Curtains! 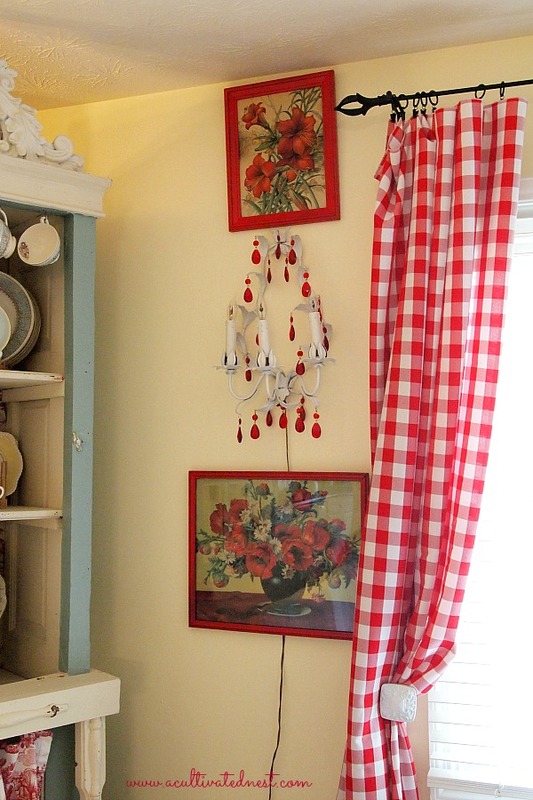 As some of you may remember, I took the red toile curtains that were in my living room and put them in my office/craft room. At first I had planned on making some curtains out of drop cloths. I hung the drop cloths to see how I would like them and after living with them for a few weeks I decided they just weren’t for me. Whatever I was going to do them, paint them etc was going to take time and I have a lot going on right now and don’t need one more unnecessary project. So I bought some red buffalo check tablecloths on ebay and in about 10 minutes I had new red check curtains for my living room! Love, love, love them!! Yes, these cute curtains are tablecloths! These are not the same material as the tablecloths I found at TJMaxx that I used in my dining room. Those are a cotton/poly blend. These I got on ebay and they’re 100 poly and I love how they hang! They’re so silky! They were $19.99 each with free shipping! So $40 dollars for new curtains that I absolutely love is just amazing! They’re already hemmed so all I had to do was hang them with curtain rod clips from Target. So there was no sewing involved and they went up in 10 minutes! This is definitely an easy and affordable way to get great looking curtains. You can line them if you prefer but I just left mine as is. You can make a rod pocket if you like but clips are so easy. Aren’t those curtains just totally me! White furniture with red accents is my favorite look so I don’t know why I even try to go with neutrals sometimes! 🙂 I guess I see it so much of it on Pinterest and it looks so pretty in other people’s homes. I just gotta have my red! 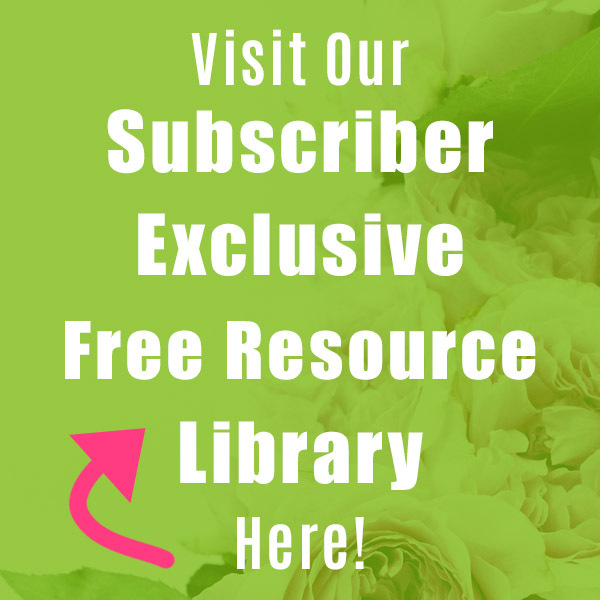 You are on my blogroll, but without an image, (have you requested that?! ), anyway, when I read ”red buffalo check…” –that was enough! I beat the speed of sound to get here! 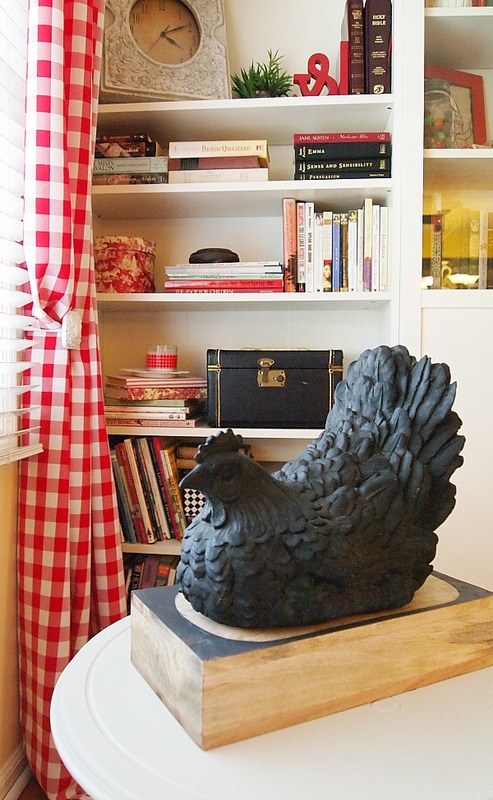 Gorgeous vignettes awaited me, red and white and checks and, (my latest temptation! ), tiny touches of TURQUOISE for whimsy and splashes of freshness. Your 10 minute curtains are creative and BEAUTIFUL! Thank you! You always have something sweet and encouraging to say! I think most if not all WordPress Blogs show up with no photo. I don’t think I’ve seen a blogroll that had photos of a WP blog. I wish it did show a photo. That was the nice thing about being on blogger. I’m still undecided what I want for window treatments in our dining room, but for a while I was searching for affordable buffalo check curtains. Who knew I should be searching for tablecloths instead?! Your tablecloth curtains are perfect in your living room. 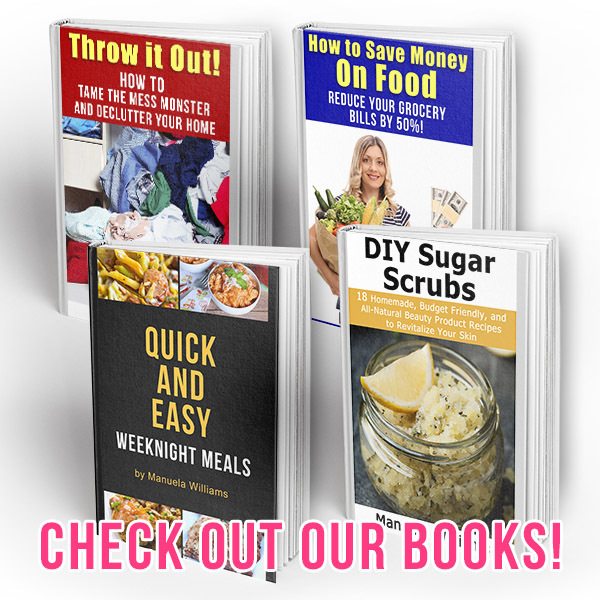 Thanks Vickie – I’m loving them! Thank you! I think they’re my favorite curtains ever! Love your new curtains:) Enjoy your week dear Manuela, BIG HUGS! I love them! How wonderful that you found them ready to hang. Until you showed us the black nd white ones, I would have never thought to use tablecloths as curtains. That is such a great idea. I’m like you, I see white in other peoples homes and I love the look, but it’s not me, nor is it my houses. Your new wt’s are gorgeous! 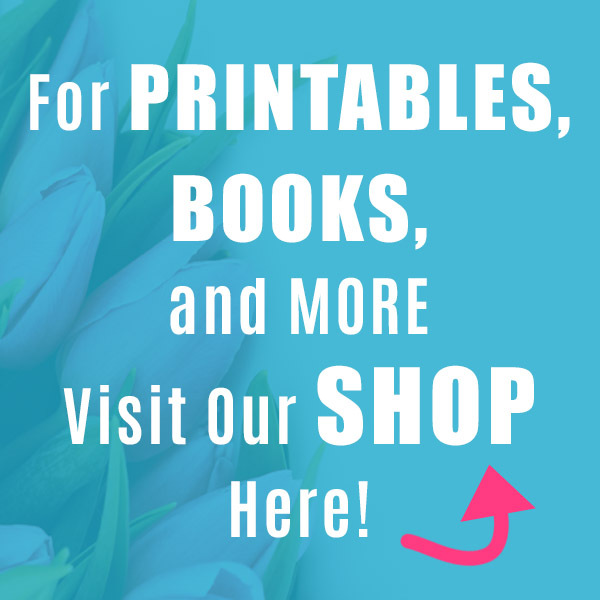 They are perfect for you and your room! Be still my heart 🙂 Love those! They ARE totally you, Manuela! I love how they look in this room. They do hang nicely, too. I tried to take a page from your book and looked at tablecloths for our home office to use as curtains, but the designs/colors in the brown/beige weren’t grabbing me. I found a pair online at Kirkland’s and ordered those. Just waiting for them to arrive and hopefully they will work. 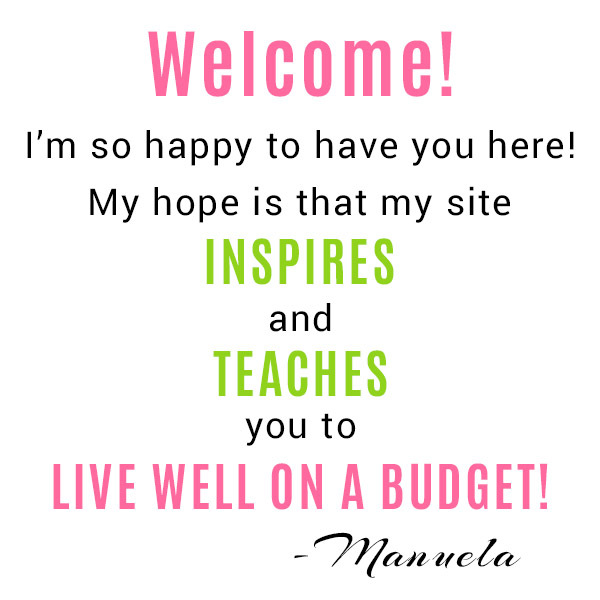 Manuela, it made me so happy to read this post. I could just hear the excitement in your voice and you’re right…it’s VERY YOU! 🙂 Hugs! You are such a clever shopper! I love these new curtains and they really do suit your home’s decor with all the red accents. They are perfect! And cheap!! Have a great week. Pretty! I love how they pool onto the floor. 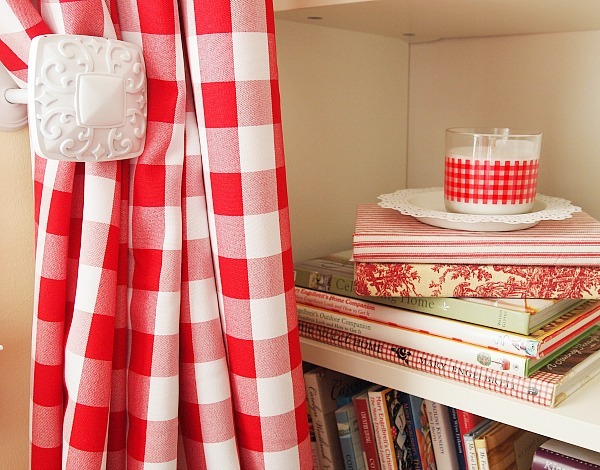 Love, love, love your new red checked curtains. Wow, they look great in your living room. what a clever idea! And I love it when I find something I love at a bargain price. You need your own show on HGTV! Oh I love the idea of using tablecloths! No sewing and great fabric! LOVE THEM! Yes, they are so you. And me! I’ve got to look for some. They would be perfect in my living and dining rooms. Oh I love buffalo check and the red and white is gorgeous! I love them!!! Great price, great look, easy project. I found some red tablecloths on end-of-Christmas clearance last year for $11, cut each in half, made pockets, and they’re hanging in my bedroom – I really love them, and for only $22. But I must say I like your buffalo check better! Thanks for sharing with us, I saw your link at Cozy Little House. I had to laugh at Poppy’s comment!! I felt the EXACT same way! 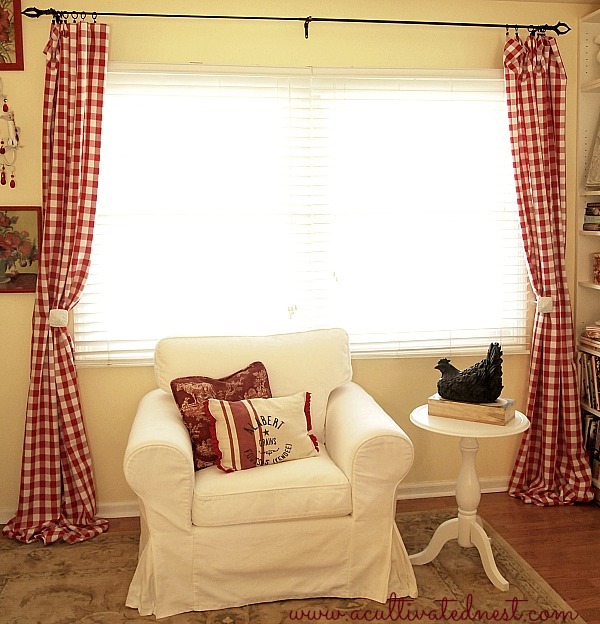 I’ve been thinking about getting red plaid curtains, but I have so much going on right now and it’s not a priority but it’s definitely something I’m going to consider and now I know where to get them! Great job as usual. I just love how bright and cheerful they make the room look. I also loved the tablecloths you used in the dining room. Thanks for sharing. I clicked on your link because I have been looking at red buffalo checked curtains for the front porch, but I was not happy with the prices that I was seeing! Thanks so much for your tip about using tablecloths. I’m like you. I admire people’s neutral spaces but they aren’t ME! Red buffalo check curtains for the porch sounds so cute! Check out ebay for the tablecloths. Like I said, I paid $19.99 per tablecloth and shipping was free. Yours may be even cheaper if you don’t need them as long as mine. Those are perfect for your room, Manuela! Using tablecloths is such a clever idea! I love the look of the clips, too! They are perfect! So YOU! I pinned them on Pinterest too! I bought black and white Buffalo Check for my living room, and Red for my bathroom from Christmas Tree Shops. I’ll be showing those on the blog next week. I love them! Your dining room was my inspiration – and we use the same colors, red, white, yellow and black so I knew they would look great! Love’em! Good tip to look for tablecloths–consider it done! Your new curtains are fabulous! What a clever shopper you are. (Of course, it helps that you have a good eye!) Love your style! these new curtains scream…”MANUELA!” … I like ’em. I’m with you. I really do like color. So my old couches were plaid…and usually covered up with blankets and quilts for a more cottage ‘neutrally’ color. Now my new OLD couch IS NEUTRAL…I have drop cloth curtains…but I’m thinking I need some color. I must see what I can find. I may just have to paint my drop cloths. That’s what their for right? For painting! Manuela these looks so pretty. Clever about looking for tablecloths. Never thought of that idea. I am a sucker for red and white and your space is just gorgeous! So cute! What a fantastic idea… tablecloths as curtains. I’m keeping this in mind for my bedroom redo come Spring, thanks! I just love your red checked curtains!! Also loving how easy they were to hang. The red accents with your whites are so pretty!! Wow — so pretty … this room is so chipper! 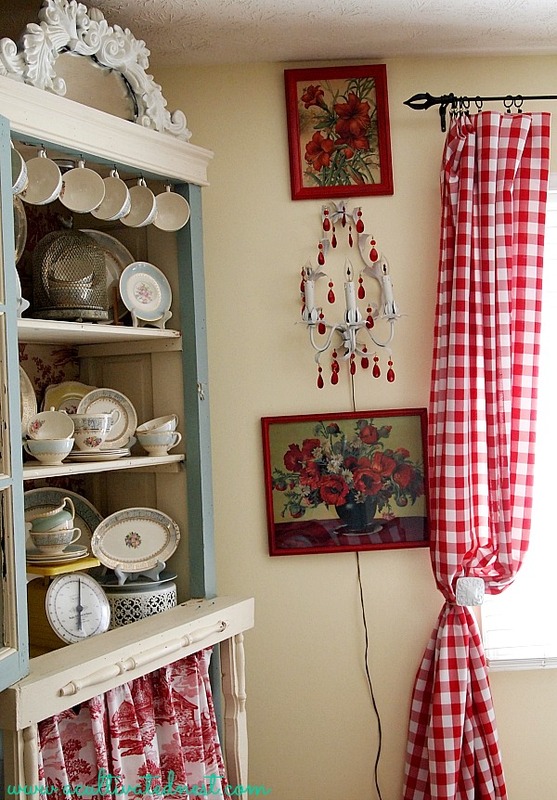 Love the red check curtains and how the accents of red pop against your white furniture. Visiting from Savvy Southern Style. Have a great day! Wow, these really are pretty curtains and I would never have guessed they are tablecloths but you have given me a great idea to be able to change window treatments with the seasons using tablecloths! And I am a big TJMaxx and Home Goods shopper. That’s such a cute idea! I love my TJXX! This is a great idea – using the tablecloths. Love the red against the creamy walls and your white furniture. I just painted my kitchen yellow (White Raisin by Sherwin Williams) and purchased red buffalo check curtains for my patio doors. I wasn’t sure how it would turn out, but now that I see yours, I’m excited for my curtains to arrive!